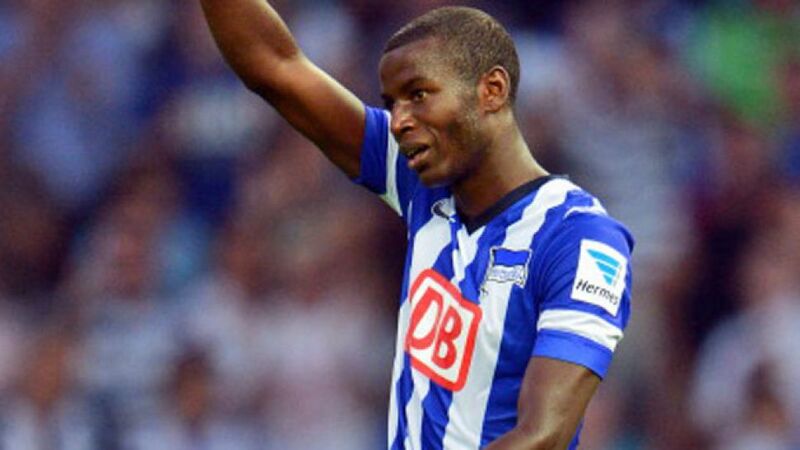 Berlin - Hertha Berlin pulled the plug on Hamburger SV's 50th anniversary celebrations, after Adrian Ramos netted the decisive goal in a 1-0 win. Hertha spurned their fair share of chances, before Ramos struck with 16 minutes remaining to condemn the Bundesliga's only ever-present club to their second defeat in as many outings. Making his first Bundesliga start since Matchday 32 of the previous campaign, Hamburg’s Zhi Gin Lam forged the first opening of note, cutting in from the left-hand side and firing straight at Thomas Kraft. The Hertha goalkeeper was called on again moments later, this time sticking out a boot to deny Artoms Rudnevs after a mistake from Nico Schulz. Hertha’s response was swift, with Ramos coming within centimetres of applying the telling touch to Hajime Hosogai’s right-wing cross. Anis Ben-Hatira was likewise beginning to make his presence felt in the Hamburg half, but that little bit of quality was too often the missing ingredient in the final third. The same could also be said of Hamburg who, celebrating exactly 50 years in the Bundesliga, offered very little as an attacking unit, whilst looking decidedly disjointed on the back foot. When they did get forward, HSV captain Rafael van der Vaart was unable to make the most of a free kick in a promising right-wing position, instead directing the ball down the throat of Kraft. A somewhat stilted encounter opened up after the restart, with the hosts continuing to carve out the better chances. Creeping unmarked into the HSV box, Ben-Hatira met his match in Rene Adler, who then threw himself at Ramos’ follow-up strike to prevent a certain goal. That flurry reignited the fire in the Hamburg bellies, but Maximilian Beister failed to make his chance count from close range. Sensing Hertha might be losing their grip on the game, head coach Jos Luhukay threw Ronny into the fold to near-devastating effect.The Brazilian’s slide-rule pass found Ramos, who shrugged off the attentions of the Hamburg back four and fired into the side netting. The signs has been coming and the hosts got their long-overdue reward in the 74th minute. Schulz did the hard work, bursting towards the byline and pulling back for Ramos to stroke home, despite the best efforts of Heiko Westermann. Hamburg's Beister came closest to levelling, but Kraft was in no mood to relinquish his side's place in the top five, pulling off a gutsy save to leave Hamburg with a serious bout of the birthday blues.